This is common enough that I thought I'd write a little bit about it. See, in this case what they're calling "stupid" is something that I call "intriguing". What they're discovering is that so far they've only met "nice" and "normal" things, and that there are things out there that are not "nice," not "normal," and which do not behave in the way they expect. So let me give you a simple example. Consider a collection of points on the plane that falls into two distinct regions. That means that we can draw a line separating them. The line separating them is sometimes called, oddly enough, a "separation" (I'll bet you didn't see that coming!). In fact it's also call a disconnection because it shows that the points on the plane, the regions, are disconnected, and that you can't get from one region to the other. 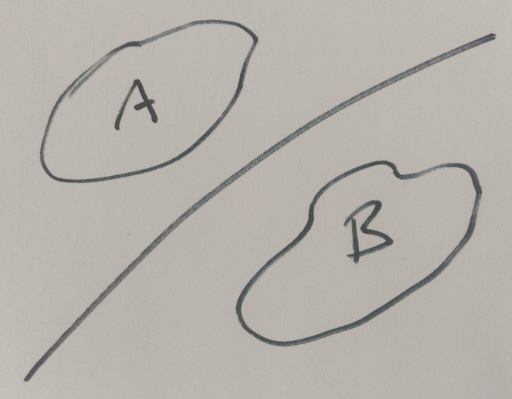 So if we have a set of points and there is no way we can draw a disconnection, no way that we can draw a line separating the points into two (or more) regions, then the set of points must obviously be connected. 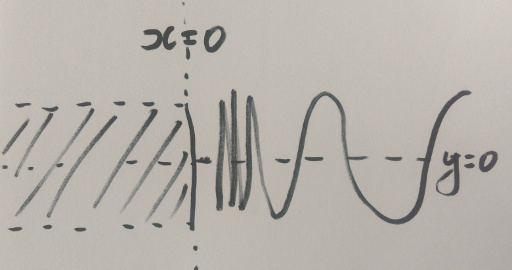 and let's additionally take all the points (x,y) where x<=0 and -1<y<1. What does that look like? At this point I'm not including the possibility of a "number" that's greater than zero but smaller than every positive real. Down that path lies non-standard analysis, and it's, well, non-standard. So the assertion that there is no disconnection relies on the fact that we're using the real numbers that we know and love. Well, that we know, anyway. It's not possible to draw a disconnection on this diagram, as there is nowhere to cut through and divide things up into two regions. However, you can't walk from the bit on the right to the bit on the left, as to do so you would have to do infinitely many "wriggles," which isn't possible. Being unable to walk from the bit on the right to the bit on the left (or vice versa) says that it's not connected in the natural, normal, or usual sense of the term. So there's no disconnection, but it's not "connected" in the usual sense of the term, because we can't walk from anywhere to anywhere. Well now you're just being stupid. A set being path-wise connected implies that it is connected, but the example given shows that the converse is not necessarily true, that a set can be connected without being path-wise connected. To be path-wise connected is a stronger requirement. But I'm not. What this example shows is that the definition that seemed so reasonable in fact has a flaw, and the definition of "connected" based on "there is no disconnection" has captured something unintended. And this is what a maths degree is actually about. It's about being able to be precise, and to be sceptical about things that look reasonable, but which don't have a proof. It's about being able to follow a long chain of reasoning, and to know whether or not the argument is sound. Usually the things being reasoned about are abstract, and then the techniques have a value of their own in possibly unexpected ways, but it's really the reasoning itself that is the real prize. How can I break it? How can I know for sure what's true? It's hard to get this right, and it's hard to develop these skills, but nothing worth having comes for free, and it's those abilities that make the maths degree of value no matter where you end up in your life and career.